The inaugural LA SIG Awards Program was launched in July 2015. The Awards program recognises excellence in the practical application of LA to enhance learning and teaching. A key driver for the Awards program is to create and share resources about effective LA practices. We want to give a voice to all who are working with LA to improve learning and teaching – whatever the scale of their endeavours. To this end, all presentations from Award applicants have been made available for viewing on the SIG website. We believe these presentations will form an important resource library around the use of LA in tertiary education across Australasia and New Zealand. The winner will be announced at the ascilite2015 conference in Perth. You may view all of the 2015 award applications here. Please note that the ascilite2015 Conference Early Bird registration closing date has been extended by two weeks to Friday 23 October so there's still time to take advantage of the lower early bird rate. Although the full conference program has not yet been announced, you may be interested in taking a look at the great workshops that have been scheduled for this year's conference. And if you haven't already seen some of the exciting speakers lined up for the conference, you can view their profiles here. The full conference program is expected to be released soon. ascilite members are invited to stand for election to the ascilite Executive Committee. Current ascilite financial members who value the services and professional community engagement offered through our not-for-profit Society, and who believe they have the time, commitment and dedication to work in a voluntary capacity to contribute toward a variety of ascilite activities, are invited to nominate for election to the Executive Committee. The deadline for applications has now been extended to 14 October and full details about how to nominate may be viewed here. ascilite members are reminded that nominations for ascilite's three award categories are open until 25 October. Several submissions have already been received for the 2015 Innovation Award and you may also wish to consider nominating your own project. Nomination forms and award criteria are available on the website here. The DEANZ2016 abstract submission deadline has been extended until 19 October 2015!! Please submit if you haven't already in relation to the conference focused on open, flexible, distance and mobile learning with the Hobbiton theme, "There and back: Charting flexible pathways in open, mobile and distance education" (see attached flyer). We have a range of submission options to choose from – refereed papers, practice papers, Postgrad Student paper, Poster, Workshop and Speed sessions. For more details on the options and to submit your abstract, please visit the DEANZ website. Feel free to share with colleagues and students. We'd also like to encourage postgraduate student participation as there will be a $200 prize for the best postgraduate student paper sponsored by the Wilf Malcolm Instituted of Education (WMIER). Please direct your enquiries to deanz2016@deanz.org.nz. We look forward to welcoming you to Hamilton in April 2016. The Australian Research Council (ARC) annually awards three-year Discovery Early Career Researcher Awards (DECRAs) to create opportunities for early career researchers to develop their research careers. The University of Technology Sydney (UTS) seeks to support outstanding ECR applicants in the area of STEM Education and will offer ongoing teaching-research positions at the end of the fellowship to successful applicants. The University will help successful non-Australian applicants to organise the appropriate visa. UTS has a strong track record in STEM Education research, and is committing resources to developing its research strength in this area. In particular, UTS seeks early career researchers with expertise in science education, maths education, teacher professional learning with technologies, or mlearning in science and maths. Successful candidates will work with an outstanding research team including Professors Sandy Schuck and Peter Aubusson, who lead a series of externally funded research projects in this area. If you are interested in exploring the possibility of applying for one of these awards, in first instance please e-mail your CV to Sandy Schuck by the 13 November 2015. To be eligible for a DECRA, applicants must have been awarded a PhD in the previous five years (or longer if combined with periods of significant career interruption). See Funding Rules and FAQs for detailed information. As a general guideline, to be competitive for one of these awards a researcher should have published a number of refereed journal articles in prestigious journals, including several as first or sole author. Publication of an academic monograph with a prestigious publisher makes applicants highly competitive. Open Polytechnic are requesting proposals from instructional design companies. The RFP document may be viewed here and responses are requested by 23 October. The work is estimated to be worth between $NZ500k to $NZ1m per year. 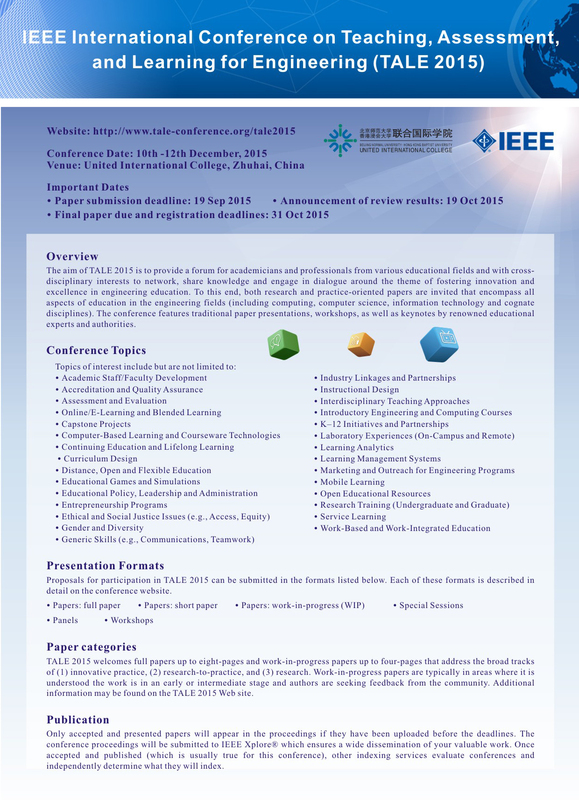 The International Conference on Teaching, Assessment, and Learning for Engineering (TALE) is the annual premier conference held in the Asia-Pacific Region (IEEE Region 10) by the IEEE Education Society. The TALE 2015 Conference Organizing Committee is pleased to announce that the paper submission deadline is extended to 9 October 2015. Accepted and presented papers will appear in the proceedings if they have been uploaded before the deadlines. The conference proceedings will be submitted to IEEE Xplore, which ensures a wide dissemination of your valuable work. Once accepted and published, other indexing services evaluate conferences and independently determine what they will index. Proposals for participation in TALE 2015 can be submitted in the formats listed below. Each of these formats is described in detail on the conference website. TALE 2015 welcomes full papers up to eight-pages and work-in-progress papers up to four-pages that address the broad tracks of (1) innovative practice, (2) research-to-practice, and (3) research. Work-in-progress papers are typically in areas where it is understood the work is in an early or intermediate stage and authors are seeking feedback from the community. Additional information may be found on the TALE 2015 website and you will find a direct link to the Call for Papers Flyer here and a link to paper submissions here. UNSW Arts and Social Sciences is one of the most academically energetic and socially engaged faculties of its kind in the Southern Hemisphere. Over the past fifty years, UNSW Arts and Social Sciences has been shaped into a lively and approachable community of scholars and students, combining extraordinarily diverse scholarship with our commitment to public engagement, social inclusiveness and an international perspective. Our high quality teaching and enviable international research position demonstrates the enduring value of our scholarship. The Educational Developer will work closely with the Associate Dean (Education) to lead the teaching and learning strategy of UNSW Arts & Social Sciences, working closely with academic staff across the four Schools of the Faculty. For further details consult the UNSW job site.